Signing prestigious Irish talent has become an increasingly prominent theme of our work here at DB Sports. Co-Founder David Berber has lead the charge in this work, sourcing the finest youth talent across the country, looking to secure their futures with the best deals suited to them. Today we have more fantastic news of such nature, where we can announce DB Sports have signed up Ryan Burke. 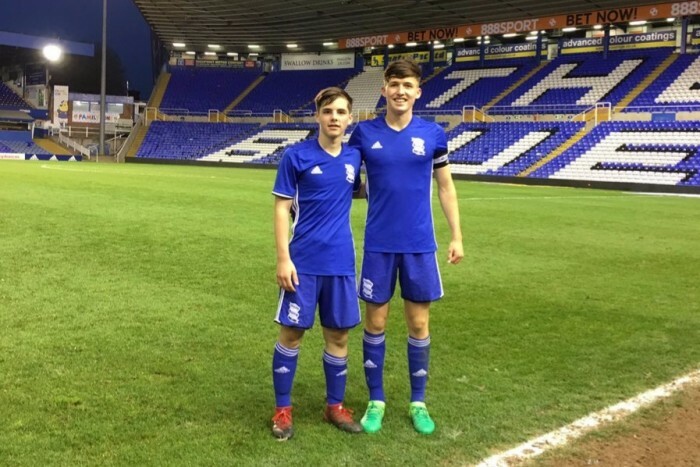 Burke (16) hails from Dublin, and currently plies for trade for Birmingham City, wherein he is looking to cement himself in the Blues youth set-up, before making a move toward the first team in the coming years. Burke was a star in the youth soccer scene in Ireland before making the move across the Irish Sea to England, playing for Crumlin United, St. Joseph’s Boys AFC, and ST.Patrick Athletic. It has been a journey illustrated through hard work for the Dublin youngster, but he has known success from the very start. Indeed, Burke won three consecutive league and league cup doubles in his first three years with Crumlin United, culminating in a Player of the Year award at the end of his Crumlin Utd tenure. Next up was four years at St. Joeys where he picked up two league titles and two league cups, as well as a DB Sports Champions Cup trophy. His time on the international scene began then, too, picking up his first cap in the 2015/16 season when the Boys in Green took on Turkey. Young Burke has some special feats to his name outside of the norm; he has never lost a home league game in seven years, while on his school team Ryan lead his side to their cup win in 18 years when they lifted the Leinster Cup. DB Sports Co-Founder David Berber spoke effusively about signing Burke, saying: “Ive been watching Ryan play since he was with Crumlin U11’s one of the best schoolboy sides Ive ever seen. Ryan is a fantastic kid, great personality and his work rate and determination is second to none. The fact Ryan has opted off his own back to continue his Irish Leaving Cert through distant learning sums Ryan up for me. Ryan has a wand of a left foot and is one of the most technically gifted players Ive seen in years”. Ryan will join DB Sports player and childhood pal Joe Redmond at the Blues. Joe has recently traveled with the 23’s on a pre-season camp to Valencia and the Crumlin/Joeys duo will hopefully be back in action together in the 2017/18 FA youth Cup. For more information on such great work keep an eye on our regularly updated blog here.